Chronic pain and gym fatigue can often be debilitating, invading your everyday activities. If you’re tired of the muscle aches why not try the HealthmateForever YK15AB? This device uses TENS technology to alleviate pain effortlessly and quickly. If you’re looking for relief, it’s a worthwhile investment. TENS stands for trans-cutaneous electrical nerve stimulation. This means the low electrical frequency that a TENS unit emits mimics the nerve system in order to reduce pain. They block brain signals that are traveling to the injured area. As a result, the user feels almost immediate relief. At the same time, TENS units help to release endorphins. So, not only do you experience a sense of pain relief but using these treatment methods also gives you a sense of euphoria. It’s almost like the body’s own natural way of producing morphine. The effect feels very similar to a massage, so overall, it promotes relaxation. Another benefit of using TENS devices is that you’re in complete control of your treatment. You decide how long your session should last as well as the intensity of the electrical current. Most devices are quite small so you can even use them while at work. TENS units are often confused with EMS machines. Whereas TENS is used for pain relief, EMS devices contract muscles in order to strengthen them. Both can be very beneficial without having many side effects. We review one unit that has become a consumer favorite. The HealthmateForever YK15AB has all the benefits of a TENS device. Not only does it provide pain relief but it has a variety of features that allow you to target your pain directly. It’s a powerful device that’s able to accelerate the body’s healing process and its convenient size allows you to transport it easily and use it anywhere, whether you’re at home or the office. It feels like a massage so you can sit back and relax while your pain dissipates. Although it’s not recommended for certain conditions such as pregnancy or epilepsy, it’s perfect for easing aching muscles after a workout. Using a combination of the two modes means you have complete control over your therapy and you can tailor it to your needs. There are even 20 intensity levels so you can amplify your session if you desire. Each mode is designed to treat pain in a variety of beneficial ways. An LED screen makes the HealthmateForever’s display easy to read as all of the information is displayed clearly. It’s even back-lit so you can use the device in the dark. Once your session time is complete the screen automatically switches off which saves you battery in the long run and also makes it safer to remove the wires. If you feel asleep during the relaxing treatment, there’s no risk of anything overheating. The HealthmateForever uses three AAA batteries. This means the longevity of the power depends on the quality of the batteries, but these can easily be replaced. When you first purchase the device, it includes three batteries so you can immediately start using it. The unit itself requires very little power to work so depending on your frequency of usage, the batteries could last up to three months without needing replacing. As a result, it’ll be a long time before you’ll need to pay any additional costs. The HealthmateForever YK15AB has a two year warranty which applies when the device doesn’t work as advertised. Q: Is it a TENS unit or EMS? A: Both. 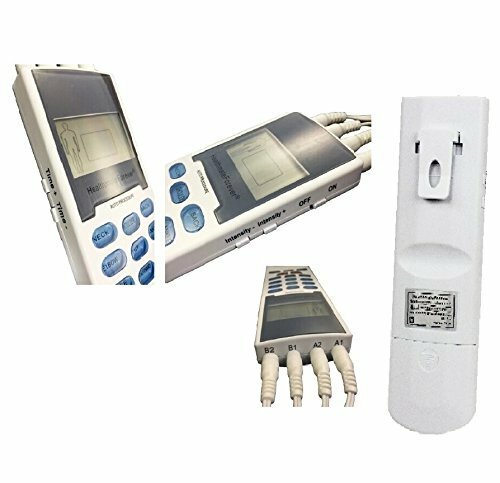 Although the device is designed as a TENS unit the variety of modes means it can be used as an EMS machine if you set the intensity high enough. Q: Do I need to use a gel? A. No. The reusable pads already have gel on them to ensure maximum conductivity and also to stick to your skin easily. A: Studies have shown that not only are TENS treatments safe but they’re also beneficial for your health. On the other hand, it’s not recommended to use this device if you have certain conditions such as tumors or skin conditions. If you’re concerned, it’s best to consult with your doctor before using this equipment. Using the HealthmateForever YK15AB ensures relief from pain and its massage-like feel helps you relax. With so many modes you can control your treatment so it suits your requirements. The benefits of TENS treatments are FDA approved so you’re guaranteed the relief you desire. Are you ready to take control of your pain?